Once served at festive meals, guinea fowl capons have disappeared in recent times. The Label Rouge poultry farmers reintroduced them a few years ago for the end of the year festivities. Since then, the most refined gourmets have unanimously lauded their merits. Their most striking features are their marbled flesh and a delicate, noble flavor that is very reminiscent of game, all immediately noticeable upon tasting. Hardy breeds selected for the quality of their meat and their slow growth. 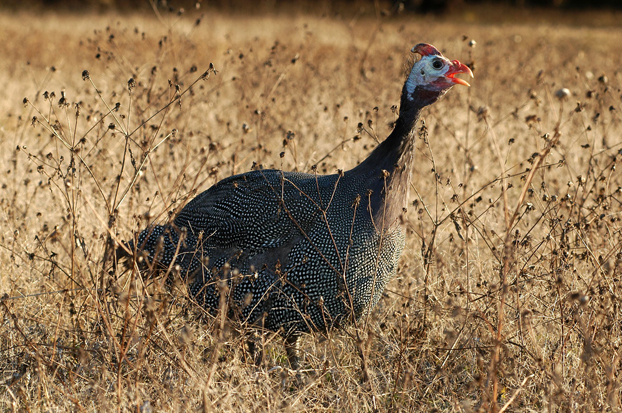 Guinea fowl capons are reared in little flocks in small, well-lit poultryhouses (400 m² maximum) in natural daylight. The maximum stocking rate allowed inside the poultryhouse is 10 capons per m². As soon as their feathers are fully developed, they are let outside and allowed to freely roam a grassy/shady area (3 m² minimum per capon) or in a perchery. They are surgically castrated before the age of 13 weeks by an experienced operator inspected by a certifying body. At least 70% of their feed during the fattening period must be comprised of cereals and cereal-based products. They are kept inside for the last two weeks of the fattening period and fed a diet containing at least 80% cereals, plus extra dairy supplements if necessary. Label Rouge guinea fowl capons are not slaughtered until they reach the age of 150 days minimum. Label Rouge guinea fowl capons are class A fowl (European standard pertaining to external appearance) and they must therefore be perfect in terms of their presentation. They can be presented partially eviscerated (with giblets), ready-to-cook, or cut up into portions. Their mean weight as ready-to-cook fowl is around 1.7 kg. 13 days maximum after slaughter for cut portions of guinea fowl capon.